At Open Source Capital we use a Private Syndication Offering as a Capital Campaign and Branding Activity oriented around a specific project. Branding has become more important than ever in the age of social media. A continued presence on the OPEN BOOK PLATFORM is a more modern approach to engaging with investors than traditional capital campaigns of limited duration. Approaching capital raising only when needed can have an unintentionally isolating effect on the investment community. In an age of social media, it can be interpreted as though you only have time for investors when you want their money. Firms that have a continuous presence on an OPEN BOOK PLATFORM are in the mindshare of their target audience. Investors that subscribe to our system have extensive capital ready to be deployed at any given moment, and the firms that maintain higher and more accessible profiles have a much easier job attracting capital when the time is right. 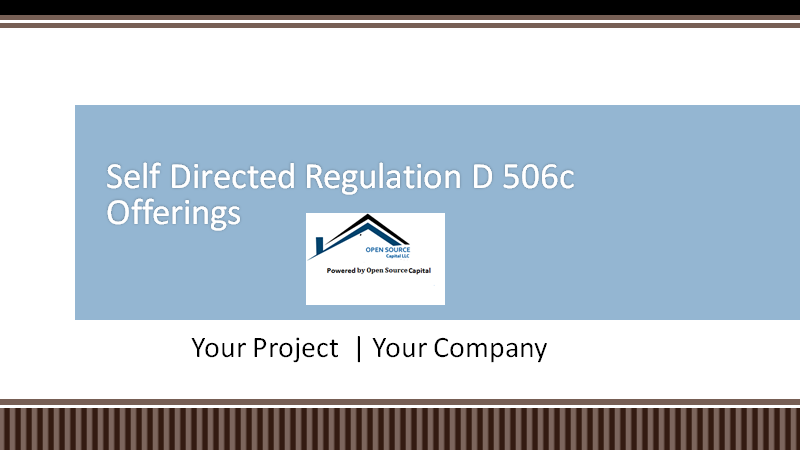 Each Regulation D 506 (c) Syndication Offering requires a unique strategy for the capital needs of the individual project and its ownership. Therefore, we maintain a flexible approach to structuring transactions. In addition to helping you advertise for equity in the deal, we typically source senior debt from our network of relationships to prudently capitalize your projects. A best-efforts” Syndication is one for which a Broker/Dealer will commit to underwrite and market the securities but leaves the Offering to the vicissitudes of the market. If the deal is undersubscribed, the deal will not close—or may need major revisions to clear the market. Before engaging with us we will outline our strategy and view of the current market. We will prepare an engagement letter describing the terms of the transaction and the fees involved. The work product we prepare will include everything you need to allow a FINRA Broker/Dealer to legally sell your Offering on a real estate portal to accredited investors.